Celina Aguti, 63, a widow who is also taking care of Akullo, said her husband was killed by LRA rebels during the peak of the insurgency. Aguti said with the help of her step daughters in law and grandchildren, they are ably looking after the old woman. “She stays with me but likes going back to her house to cook her own food,” Aguti said. Aguti said Akullo lately complains of abdominal pain, headache, chest pains and sometimes her knees swell and hampers her from walking. The area LC1 chairperson, Nelson Ayor, 40, who is a step son to Akullo, said only two people benefited from Social Assistance Grants for Empowerment (SAGE) in the village with one already dead. He said Akullo is not getting the funds because at the time of taking the particulars of beneficiaries, the computers failed to recognise her. He went to the chief administrative officer of Dokolo district but by that time, there was nothing they could do to help her benefit from the scheme. Generio Otwak, 79, Akullo's only remaining son, said his mother was born in 1888 which would make her 130 years old. Her grandson Leo Opige commended New Vision for publishing Akullo's plight which enabled a reader to assist her. “We had given up on the government's help." Opige said what is given to his grandmother is equivalent to two years of government's grant. M/s Akullo's mother gave birth to 20 children and she is the 18 th child. All the rest of the children passed away and she is the only one remaining. Celebrations for the international day of older persons were held at Bishop Flynn Secondary school in Pader town council. The function which attracted elders from all over the country was celebrated under the theme: “Act now stop discrimination against old persons”. 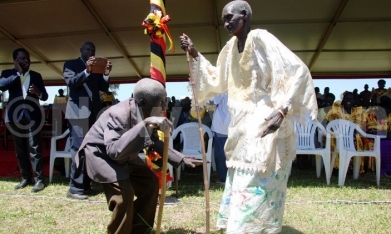 The oldest persons from Pader district who are Alijana Ongeya aged 116 years and Jojamary Akot aged 106 years were part of the celebrations. Joseph Basoga the senior communication officer SAGE program Ministry of Gender, Labor and Social Development said in this era, elders are the most vulnerable persons who are not cared for by their children. “The traditional system where the young generation would provide for the elderly has broken down, they are left to line up in banks and hospitals,” Basoga said. “Elders must not be discriminated, they built the foundation which we work on,” he added.